Come home to your own paradise.Backyard patio is your oasis from chaos with a beaustiful sitting area overlooking a sparkling pool.This home is better than new.Completely updated with bamboo wood upstairs, laminate wood downstairs & tile. Stove & double ovens have never been used.Huge den w/fireplace on one end and wall of windows on the other. Call Amanda Nicodemus 281-380-5589 for a private showing. Beautiful & secluded current owner went over-board with amazing improvements.Stunning Saltwater pool w/rock features,waterfalls, swim-in grotto.Outdoor kitchen,3 full car garage w/drive-thru,extra work space & parking, pool bath, (24×18)studio w/kitchen up,built-ins & extra storage. Main house features renovated kitchen w/S.S.appliance,granite counters,42”cabinets. Addition: Master bedroom w/gorgeous spa bath, rain shower, vessel sinks. plus second master. 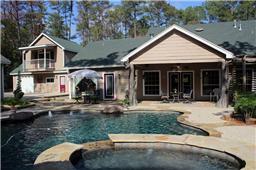 Exceptional property call Amanda Nicodemus 281-380-5589 for preview. Beautiful grand home on a quiet cul-d-sac in Country Lake Estates, situated on a 1/2 acre private lot. 5 bedrooms with upgrades galore: stainless appliances, granite countertops, 42” maple cabinets. Open kitchen and great room is perfect for entertaining! Convenient Master Bedroom downstair with huge walk in his/hers closets. 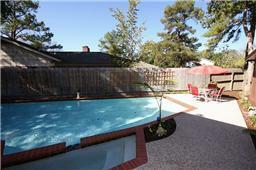 Large media room upstairs ties the 4 bedrooms and 2 baths with fantasitc view of the backyard. Incredible yard with extended patio, 8×10 greenhouse/shed. Minutes from The Woodlands. Call Amanda Nicodemus 281-380-5589 for details. Click on link below for all pictures.